MB2 Motorsports, NASCAR� driver Joe Nemechek, the U.S. Army and Action Performance Companies Inc. today issued a collaborative announcement detailing a special edition No. 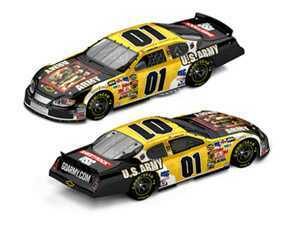 01 Army race car that will carry a tribute to the American soldier during the Coca-Cola 600 on May 30, 2004 at Lowes� Motor Speedway. Just in time for the Memorial Day holiday, Nemechek will drive a No. 01 Army Chevrolet Monte Carlo that features the TIME Magazine "Person of the Year" cover that hit newsstands on Dec. 29, 2003. The TIME cover shot will be the showpiece on the hood of Nemecheks Army-backed NASCAR NEXTEL Cup Series race car. "This recognition of the American Soldier can not be understated," said LTG Dennis D. Cavin, commander of Army Accessions Command. "The tribute reinforces that every Soldier makes a difference for themselves, their families and for the nation. It is an honor to salute all of our men and women in uniform who fearlessly serve their country each and every day." Traditionally, TIME selects a single notable person for its annual Person of the Year feature. However, for their valor and fearless defense of freedom during a tumultuous time, the "American G.I." was selected for the honor. As part of an exclusive program with MB2 Motorsports, Action Performance, the leader in the design, promotion, marketing and distribution of licensed motorsports merchandise, will produce die-cast replicas of the No. 01 Army/American Soldier Tribute 2004 Chevrolet Monte Carlo in a variety of collector scales. Both TIME and the U.S. Army have agreed to donate their royalty proceeds from sales of these die-cast collectibles, as well as other related program merchandise, to the Army Emergency Relief fund. Army Emergency Relief is a private nonprofit organization with the sole mission of helping soldiers and their dependents in times of valid need. Since 1942, AER has helped nearly 3 million Army personnel and their families with more than $837 million in financial assistance. The No. 01 Army/American Soldier Tribute die-cast collectibles and other memorabilia will be available through Action Performances standard distribution channels, including the 18-member Action Racing Collectables distributor network and the Racing Collectables Club of America. To locate an ARC distributor, please call 1-800-411-8404. To join RCCA, call 1-800-952-0708 or visit goracing.com. "With so many American soldiers serving all over the world, it felt right to create a paint scheme that would show our pride and spotlight their dedication to service during the Memorial Day holiday weekend," noted Fred Wagenhals, Action Performances chairman, president and CEO. "The Coca-Cola 600 is an impressive showcase for the No. 01 Army/American Soldier Tribute Chevrolet Monte Carlo race car. We know that NASCAR NEXTEL Cup Series fans will be extremely receptive of the car and that Joe Nemechek and the No. 01 Army Racing team will do their best to honor Americas soldiers with a victory."